Jennylyn Mercado wins the FHM Sexiest Woman title for the first time. Consequently, this is also the first time a young mom has won the crown. Unlike previous winners who merely walked the FHM ramp, the award winning and talented actress/singer performed a daring number to the hits of Beyonce (Crazy In Love) and Jennifer Lopez (Booty). Jennylyn wowed the crowd and proved she definitely deserves to be this year's Finest! And for fans and FHM enthusiasts, watch out because she just might do another cover as your reigning queen. Please watch this special coverage by Nice Print Photography. LOOK: Clint Bondad to Jennylyn Mercado: "Kasi ikaw talaga yung dahilan kung bakit nandito ako sa GMA." In the media conference of GMA Network's upcoming romantic comedy series, 'Love You Two', new Kapuso actor Clint Bondad shares that Jennylyn Mercado is the reason why he became a Kapuso. In his words, "'Yong dahilan kung bakit nandito ako sa GMA talaga is... I just want to say, dahil talaga kay Jennylyn. ", the newcomer revealed. Clint says that it was because of their successful team up in a special episode of 'Dear Uge'. Clint is part of the cast of 'Love You Two' starring RomCom Queen Jennylyn Mercado and Mr. Gabby Concepcion. Directed by Irene Villamore, catch the world premiere of 'Love You Two' this April 22 on GMA Telebabad. Ultimate Star Jennylyn Mercado delivers the latest showbiz happenings for 24 Oras's 'Chika Minute' Monday night. The 'Love You Two' star admits to have been nervous anchoring 'Chika Minute' for the very first time. Although Jennylyn is not new to hosting, she says that this is so much different because she can't make mistakes because unlike her previous hosting stints, this one does not have a "take two". Check out her interview below. What can you say about Jennylyn anchoring 'Chika Minute'? We say, good job! Do happy ever afters exist? Has Raffy finally found her prince charming? For those who missed the Pilot Episode of 'Love You Two' or those who'd want to watch it again, here's the entire episode courtesy of GMA Network. At the media launch of her latest prime time soap 'Love You Two', Ultimate Star Jennylyn Mercado was asked for her comment on netizens' clamor for her to play the Pinay Super heroin 'Darna'. Looking surprised, the once hailed Sexiest Woman in the country says she is flattered to be considered for the role. Netizens and fans claim that Jennylyn is a perfect fit for the role because of her striking Pinay features, acting prowess, dedication to fitness, and her advocacies empowering children and women. Despite being from a different network, Jennylyn once was able to cross over to Star Cinema when she did the blockbuster romantic comedy film 'Just The 3 Of Us' with John Lloyd Cruz. This year, Jennylyn is set to do another film with Star Cinema. With that said, nothing is impossible! The pilot episode of GMA Network's newest romantic comedy 'Love You Two' was a certified hit to viewers and netizens. 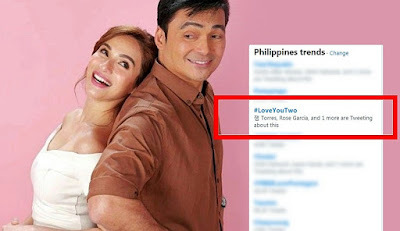 Headlined by RomCom Queen Jennylyn Mercado and seasoned actor Gabby Concepcion, 'Love You Two' earned raves online and was a top trending topic nationwide. Check out some comments of netizens below. 'Love You Two' airs Mondays to Fridays on GMA Telebabad right after Sahaya. See you tomorrow at the GMA Network Fans Day! My Faithful Husband, soon on GMA!